One of the Little Blue penguins getting weighed. 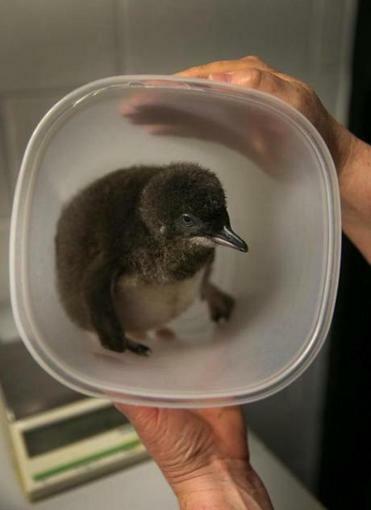 The five newest penguin chicks at the New England Aquarium have a big job to do — aside from being incredibly adorable. The three Little Blue and two African penguin chicks will serve as liaisons for their cousins in the wild and will increase the diversity of their species’s captive population’s gene pool. Little Blue penguins originate from the southern coastlines of Australia and New Zealand and the African penguins inhabit land along the southern coast of Africa. 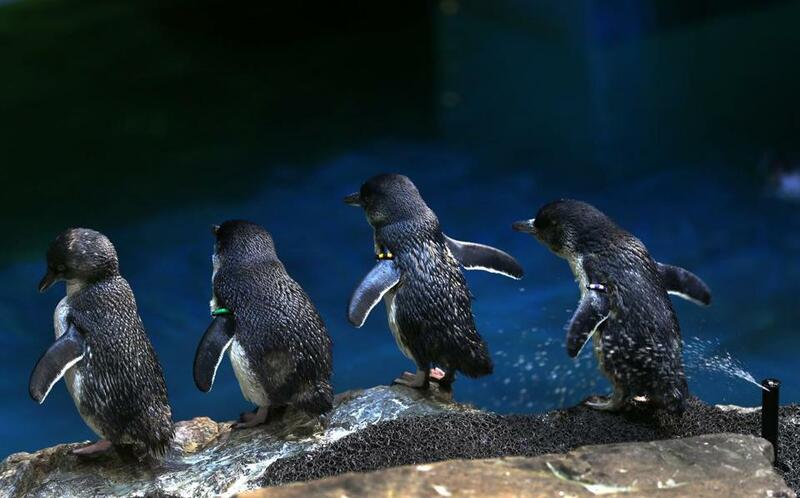 Little Blues are the smallest species of penguin and have sleek, steel blue feathers. African penguins have yellow stripes on their foreheads in adulthood. The Little Blue chicks, two of which have joined the rest of the colony while one remains under staff care, have fuzzy charcoal gray downy feathers when they hatch. 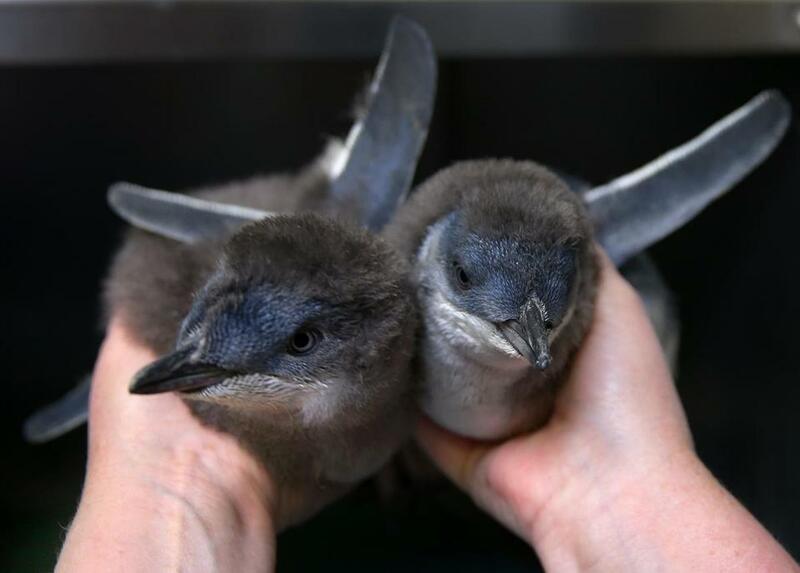 The New England Aquarium is one of the only institutions in the United States that has Little Blues, something that Heather Urquhart, penguin exhibit manager for the aquarium, hopes to change. The chicks have joined the ranks of only 64 Little Blues in United States zoos and aquariums — 29 of which are housed in the New England Aquarium. The sustainability of such a small population is a big concern, especially with regard to gene diversity and potential growth. Urquhart is currently working closely with the Bronx Zoo in New York and the Taronga Zoo in Australia to bring more Little Blues stateside within the next few months. The African penguins’ captive population is very strong, with about 800 birds living throughout the country, said Urquhart. Their wild counterparts, however, are facing serious challenges caused by climate change. Dan Laughlin, assistant curator at the New England Aquarium, said the endangered African penguins are seeing a mass exodus of their food source — primarily pilchards and anchovies — because of changing water temperatures in their native areas. Eleven of the 18 species of penguins are endangered. The 12- and 13-day-old African penguin chicks will join their 41-member colony at around 60 days old. Another African egg is due to hatch in mid-August. Laughlin said all penguin chicks must undergo a few private swimming lessons and weaning from their parents before joining the 85-bird colony at the aquarium. He added that he loves this time of year, and not just because of the chicks’ fuzzy cuteness. Adult Little Blue Penguins sit on a rock at an exhibit in the New England Aquaruim.